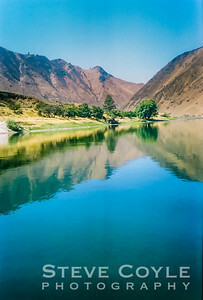 Captured this shot on a one day rafting trip on the Salmon River by Riggins, Idaho in 2005. 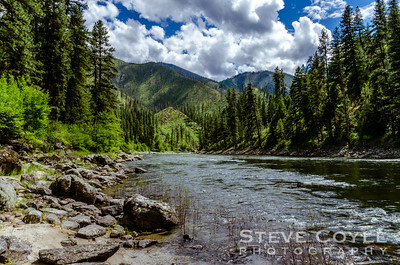 This calm part of the river was just before we got back to Riggins where we had lunch on the banks of the Salmon, then continued on for a few more hours of whitewater rafting. Hard to believe a disposable waterproof camera took a shot this nice. 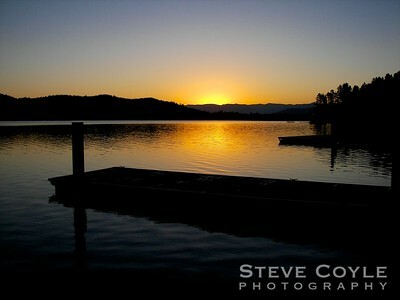 On Lake Pend Oreille in Sandpoint, ID. 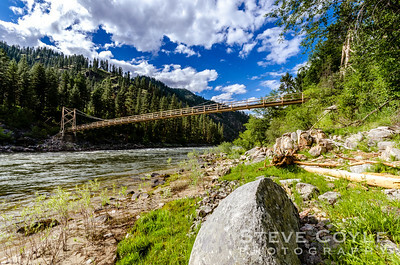 The view of my great aunt Frances' bridge on the Salmon River from the old ferry landing at Campbell's Ferry. 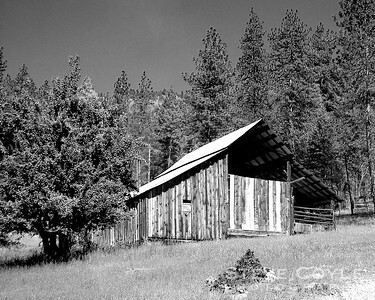 One of the barns at Campbell's Ferry on the Salmon River in Idaho. I can almost smell the pine trees. Really makes me want to go back there in May for the celebration of what would have been my great aunt Frances' 100th birthday. Heading into the Bitterroot Mountains on ID 28 on the last day of Spring. Snow storm on the mountains dropped a nice dusting as we were driving through. 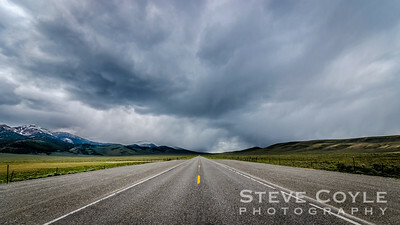 This shot makes me want to go on another road trip! 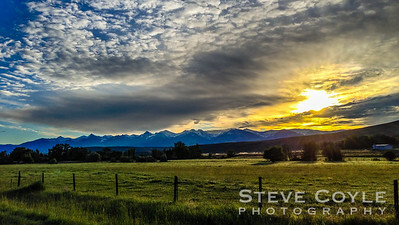 It was taken on the road to Salmon, Idaho. Amazing how long and straight this road is. 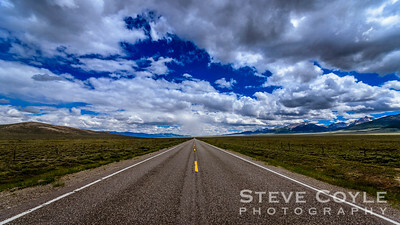 West Texas highways have nothing on this road. Plus the view is fantastic for miles and miles. 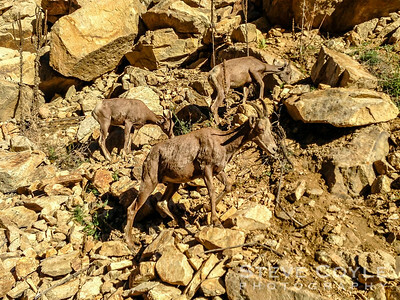 The steep mountainsides on the road to Corn Creek on the Salmon River provide excellent camouflage for the Bighorn Sheep. If these were not so close to the roadway when we passed through I do not know if we would have noticed them at all. On the Salmon RIver Rd headed to Corn Creek, aka the end of the road. 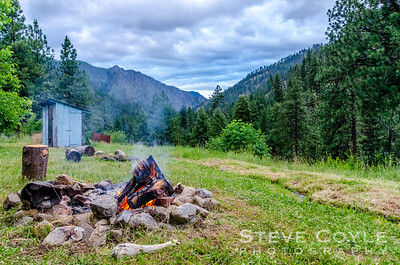 A home by itself at the confluence of the Middle Fork of the Salmon and Main Salmon Rivers. The road is on the side of the river I took the photo from. Not sure how they get in and out of this place other than by river. When there are no roads, your transportation choices become limited. 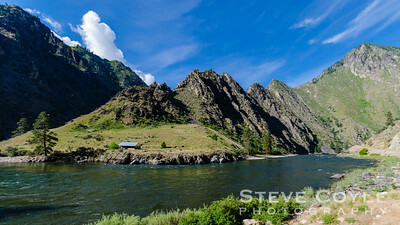 On the Salmon River in Idaho, that is just the case. 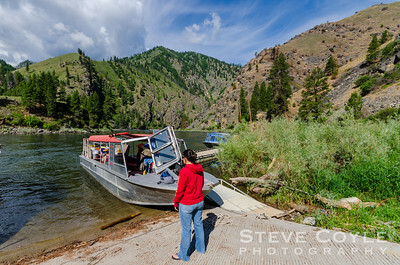 Only way to travel from one side of Idaho to the other on the Salmon is by jet boat or raft. We chose the faster route for our excursion. 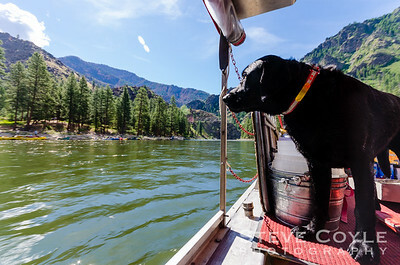 Our captain's mate and wife reviews the scene as we prepare to head down river to Campbell's Ferry. 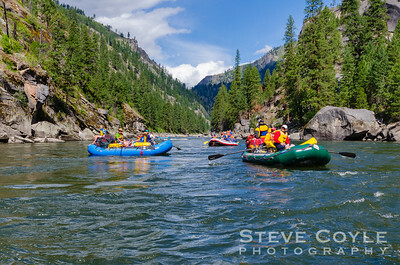 River rafting on the Salmon River. 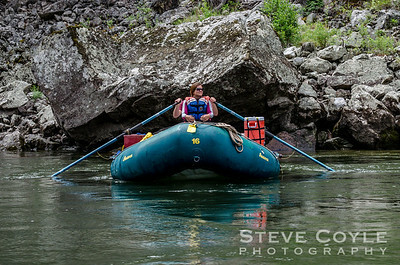 I've done a one day trip on this river in Riggins, ID, but I have it on my bucket list to do a multi day trip on the Salmon like the folks in this shot are doing. 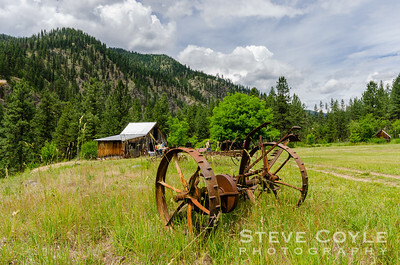 Doug and Phyllis Tims have prominently displayed antique farm equipment used in past years at Campbell's Ferry as you approach the property from the Salmon River. Anyone care to guess what this piece of equipment was used for in the past? 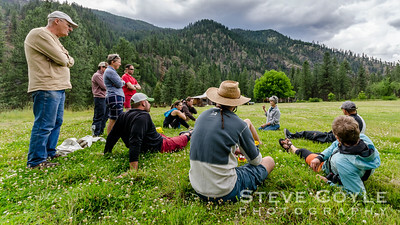 I wonder if Phyllis ever imagined she would be lecturing in the great outdoors at Campbell's Ferry, Idaho when she was teaching at the University of Utah? 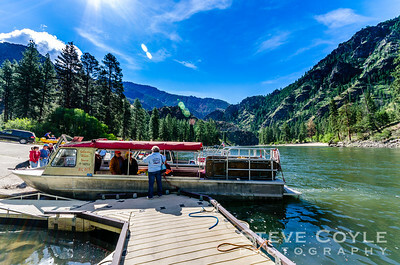 If you ever go on a rafting trip down the Salmon River and are lucky enough to stop at Campbell's Ferry, maybe Phyllis will be there to provide you with your own personal history lesson on this historic site on the River of No Return. 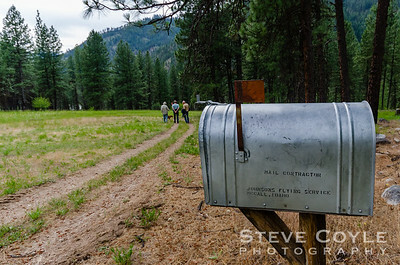 Campbell's Ferry is one of 7 stops on the only air mail route in the lower 48. The runway the pilots use is on the left. If you look closely over the shoulder of Doug Tims (middle individual), you can see the windsock for the runway. The runway is 400 feet long and on the side of the mountain. The pilots land going uphill to slow down quickly and take off downhill to gain speed and lift quickly. In the backcountry, there is no indoor plumbing. Outhouses are the way to go. 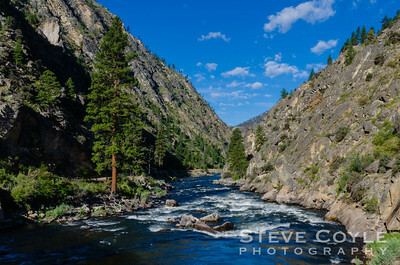 In the case of my great aunt Frances, she wanted hers to be seen from the Salmon River, in hopes of irritating Sierra Club members floating the river. So she painted hers blue. After one choice encounter with a said Sierra Club member that declared once the area Frances lived in was made into the Frank Church Wilderness, River of No Return, she would have to leave, she made it her mission to do what she could to tick off any and all Sierra Club members. Little did each know that they were both there for a common reason, keep the area wild and free of development. Honoring our friend Doug Tims who received an honorary lifetime membership award from the Idaho Outfitters & Guides Association yesterday. One of my favorite shots of Doug. 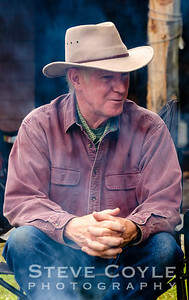 Glad I've been lucky enough to sit across the campfire from him and listen to his stories. I wonder how many others have been so lucky? While we were at Campbell's Ferry this summer we were treated to a private concert. I thought I'd create a black and white out of this shot to give it an old time feel for days gone by. I almost feel like it could be from the collection of photos from when my great aunt lived there. 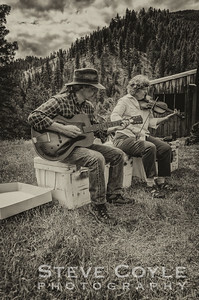 Thanks go out to Larry and Linda for entertaining us with their musical talent. 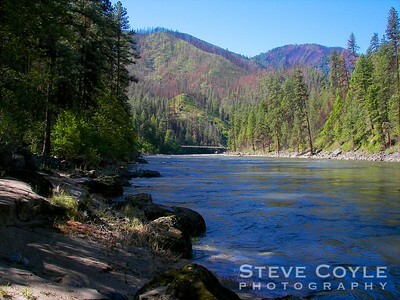 Oh what I'd do to be rafting on the Salmon River right now. Better yet, to have 4 arms to use while rafting! Never would have seen these mountains if we hadn't followed our GPS's instructions. I had checked the map and it showed this was a dirt road, which it is by the way. 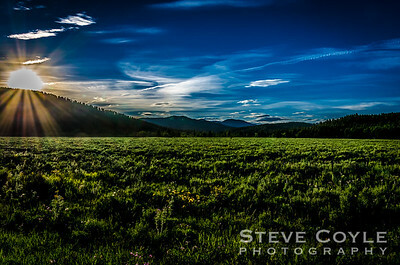 However, if we had taken the road more traveled we never would have seen the Centennial Mountains or this great sunset.